Bart on a Budget: AMD recently released the Barton version of the Athlon XP, which has twice the L2 cache of the Palomino version (512KB as opposed to 256KB). The first chip in the line to make it to market was the 2800+, which clocks at 2.08GHz. The 2800+ is expensive though, especially when compared with previous high-end AMD processors. 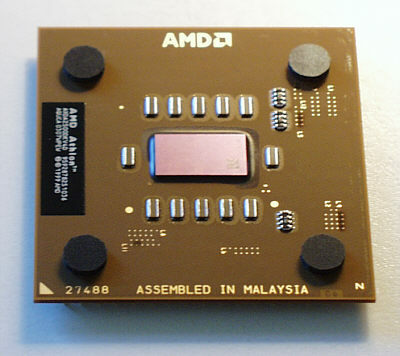 About a month later, AMD released the Barton 2500+, with a default speed rating of 1.826GHz. The 2500+ is less than half the price of the 2800+ chip, attracting the attention of budget-minded gamers. The most common question I've gotten about the new chips is, "how much does the Barton 2500+ overclock? Well that's what we're here for today. The Barton 2500+ is pictured above. The most obvious difference over the Palomino Athlon is the more rectangular appearance, which is due to the extra L2 cache. The Barton still fits into the well-worn Socket A connector, meaning that many current Socket A motherboards with 333MHz bus support will run the Barton with a simple BIOS flash update. > Asus A7N8X Deluxe (333MHz bus and the NForce2 chipset, with the following on-board devices: 2 network cards, 2 Firewire ports, 2 IDE connectors, 2 serial ATA connectors (RAID), 6 USB 2.0 ports, standard audio out and Dolby digital 6.1 audio out, 5 PCI slots and 1 8x AGP slot). I tested the system with Windows 2000 (SP2) and Direct X 9 installed. The A7N8X BIOS was flash updated to the latest, 1002A version, and I installed the latest NVidia NForce 2.03 drivers. I used Arctic Silver 3 thermal compound and installed a Cooler Master "Heat Pipe" Socket A cooler, which is shown above. It is not the absolute best cooler available (that distinction goes to the Thermalright 800/900 series), but it's darn good. 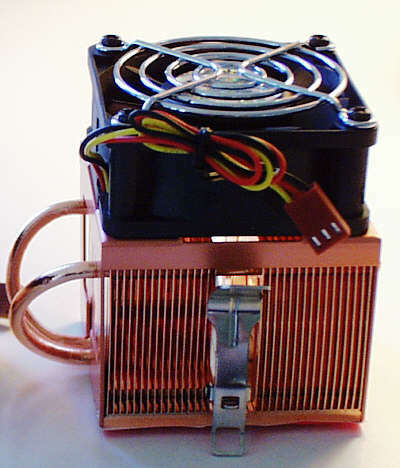 The biggest problem with the Heat Pipe is that the fan on it runs at a very loud 6,500 rpms. It's the loudest cooler I've ever used, but it definitely keeps the CPU temperature low, and stable. Rather than do tons of benchmark testing at different speeds, I was more interested in stability at various overclocked speeds. So I ran 3D Mark 2001se and Sandra CPU/Multimedia benchmarks, as well as the 3D Mark 2001se demo in a continuous loop to test how fast, and how stable the system was. I used the "aggressive" settings in the A7N8X BIOS, including the settings for the CPU and memory. I let the motherboard set the memory timing according to the SPD chip. It is quite possible that more agressive manual timing settings would have given even better performance than the "aggressive" SPD memory settings. I always ran the memory bus synchronously with the CPU bus. Overclocking While you can make some changes to multiplier settings on the Barton with the Asus A7N8X with the 1002 BIOS, bus overclocking results in better performance. So I concentrated on how fast I could up the front side bus frequency. To that end, I used Corsair XMS3500 DDR memory, which can run at 400MHz, to make sure that the memory would not affect the ability to overclock the system. The A7N8X allows front side bus overclocking from the default 166MHz (=333MHz double data rate) in 1MHz increments, up to 230MHz, and continues at 5MHz increments up to 250MHz. I did not try every MHz between 166MHz and 200MHz, I went in 5MHz jumps. I increased the core voltage to the CPU in the A7N8X BIOS from 1.65 volts to 1.7 volts. Below is a graph that shows the Scisoft Sandra 2003 CPU Multimedia benchmarks at the different speeds tested. These are the speeds I tested on the first Barton 2500+ chip (the 2500+ has an 11x multiplier setting). Below is a graph of the results obtained with Scisoft Sandra 2003's CPU/Multimedia benchmark at the tested speeds. The Sandra scores improved by about 16% at the maximum stable overclock speed. The next graph shows 3D Mark 2001se scores at the default settings for each bus setting. Barton 2500+ chip #2 Each CPU is different, and each one overclocks differently. For this reason, it is important to test as many CPUs as possible to see what the range is. Unfortunately, I only had two retail 2500+ chips on hand to test, purchased through standard supply channels. I installed the second Barton 2500+ onto the same setup, using Arctic Silver 3 compound between the Heat Pump and the chip. 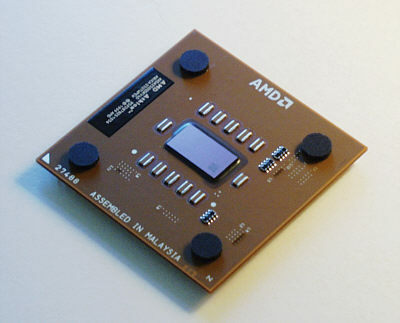 This chip also overclocked to 193MHz on the front side bus, indicating that results with the first chip weren't just a fluke. I then decided to try a higher core voltage setting to see if that would allow even higher overclock speeds. I set the core voltage to 1.725 volts, and tried 196MHz on the front side bus. That wasn't stable, so I tried 195MHz (2.145GHz). It was stable at these settings, running Sandra benchmarks and 3D Mark 2001se demo in a continuous loop. So those of you who want to try even higher voltages and bus frequencies, there is hope. Running Temperatures The chips never ran above 89 degrees Fahrenheit at 1.725 volts and 195MHz, according to the BIOS hardware monitor (ambient temperature 69 degrees). I doubt these readings were an accurate measure of the actual operating temperatures, but they do indicate that even with overclocking, the 2500+ chips run relatively cool when paired with a good heat sink and fan. Conclusions Based on my experience with a fair number of 2700+ (non-Barton) and 2800+ (Barton) Athlon CPUs, I was very surprised to see the Barton 2500+ overclock so well. With recent AMD CPUs, the overclocking headroom has typically been less than 10MHz on the front side bus. So to see a 27MHz (~16%) increase with very good stability was unexpected. There is no way to tell how many 2500+ chips will be overclockable to this extent, but if reports on the web are true, some people are even getting to 2.5GHz. Some chips will not overclock this well, so when you buy, don't get your hopes too high until you get a chance to do some testing. I expect that most 2500+ CPUs will at least overclock to 2800+ levels (2GHz), for a much lower price. The CPUs I tested were the retail boxed version. The so-called "tray" CPUs (OEM) are less expensive, but they come with little or no warranty. So take that into consideration when you make your purchase. Did I mention it's overclockable? Rating, : 5 out of 5 smiley faces (100%).